Mike's son Garth is a musician in Nashville. You can sample his music at GarthmichaelMcdermott.com. Those of us that had our first experience on the guitar with Mike are not surprised that Mike's son is a musician. He was an excellent guitar teacher as well as middle school teacher. It's great to be in touch with Mike after so many years. For those of you that noticed our newsletter photo, Mike did not grow up to be Jerry Garcia. We were unable to obtain a photo of Mike before our newsletter went to print. Update: Mike did attend the Holy Family reunion in July 2012. 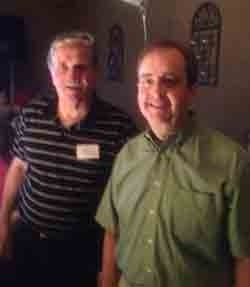 Neil Brogan '73 was kind enough to send us this picture of Mike and Neil from the event.